Blogpost of 20130915T020329Z: Why this blog? How to contribute? Revision history (UTC/major.minor.patch, in reverse chronological order): 20140515T225411Z/version 3.0.0 (made many changes, pursuant to the 2014-05-05 out-of-court legal settlement between Karen Cilevitz and Toomas Karmo), and made some expansions or other improvements-in-substance not required by the 2014-05-05 out-of-court settlement, and added bottom-of-page footer displays in the homepage style, and made one or more tiny stylistic changes, and added bottom-of-page footer displays in the homepage style, and did spell-checking with the Linux aspell tool, and validated my HTML hand-coding with the World Wide Web Consortium (W3C) Markup Validation Service tool available at http://validator.w3.org/check), 20140221T040000Z/version 2.0.0 (did reasonably polished version, for uploading to public server), 20130915T020329Z/version 1.0.0 (wrote incomplete base version, without upload to public server). I, Toomas (Tom) Karmo, have created this blog to improve the quality of debate and analysis regarding the actions of my misguided former co-worker and former comforter in Richmond Hill, Ontario, the 2014 Ward Five candidate Karen Cilevitz. I primarily seek to improve the quality of debate and analysis regarding the damage Karen has done through something she features (something she underscores, something she promotes) in her misguided election campaign, namely, her work on the David Dunlap Observatory (DDO) heritage-conservation file. Until this blog was created, the debate was uneven. Karen had a Facebook page to promote her DDO viewpoints, and additionally was much cited in the printed-newsprint version of the Richmond Hill Liberal. Karen's critics, on the other hand, lacked a satisfactory media forum. I found myself rebuffed on trying to get a key letter-to-the-editor into the printed Liberal in 2013. There remained the online Liberal, which I and other DDO conservationists used on several occasions, and in which I and others were correctly exposed to rebuttal by our opponents. This online Liberal interface, however, did not permit any one posting to be longer than a few sentences, and it additionally seemed (as far as I could determine from experiments) to prohibit more than two consecutive postings on any one topic by any one individual. A deeper problem with the Liberal Web interface was its tolerance of anonymous postings, in conformity with normal Canadian Web-newspaper practice, but nevertheless contrary to the highest journalistic standards. In some cases, this inappropriate tolerance of anonymity was harmless, with comments either promoting or opposing DDO conservation made in merely rhetorical terms, without factual or legal argument exceeding an easy grade-school level. In other cases, however (as I now explain by way of example, in a rather detailed historical digression), the possibility of anonymous posting opened the door to harm. When The Liberal ran its 2013-09-04 anti-conservation editorial entitled "What can be gained from another observatory battle? ", I replied with a comment (signing my name properly) in which I unfortunately implied that The Liberal had a general pro-development stance, quite outside the specifics of DDO. An anonymous poster hiding behind the pen name "Richie" objected to me that on at one recent question outside DDO, The Liberal had sided with the Town of Richmond Hill and against the developers. (The question on which "Richie" shone a flashlight was the question of parkland dedication, in which the Town has found itself opposing an alliance of developers and OMB.) This was a good objection, as I had to concede: "Yes, you are quite right, Richie," I replied, "I wrote carelessly, implying that the _Liberal_ has a general pro-development stance when I meant only to say that in the specific instance of DDO their stance is (inappropriately) pro-development. I will henceforth choose my language carefully." What, people will say, is the problem here? I wrote carelessly; I was corrected by "Richie"; I ate the necessary slab of crow meat or humble pie, and life went on, with an issue clarified, for the benefit of the reading, voting, taxpaying public: what was not to like? If "Richie" was to get a full measure of public respect, and not to be written off as a paid specialist, "Richie" had now come forward and identify himself or herself, with an avowal that he or she wrote as a private citizen rather than as a paid pen. That has not happened so far. It is unlikely to happen unless I prod, as I am herewith prodding, with some stick sharper than the online Liberal. So much, then, for my digression, explaining through example why anonymous Internet posting is contrary to the best public interest. It will, of course, be objected that I can level the playing field by means less drastic than putting a blog up on a full-scale Web server with its own dedicated domain name, in the style http://www.something-or-other.ca or http://www.something-or-other.com or http://www.something-or-other.org. Would not a mere Facebook page, at some such URL as https://www.facebook.com/toomaskarmo, do the job? To this objection I reply that my mission does require me to be, within the limits of fairness, maximally high in profile. (a) I intend, as an individual of shy temperament, burdened with Asperger's Syndrome, never to run for a public office, whether in Canada or in Estonia or in any other jurisdiction. My actual vocation, such as it is, lies in science and technology, not in public life. I dip my toe into the muddy brook of public life only as required by a specific mission that my general vocation at present entails: the mission, namely, of protecting the astrophysics research capability of the three DDO telescopes. (b) Karen, on the other hand, already ran for Town Council in 2010 (unsuccessfully, and with my ill-judged, inappropriately bestowed, 2010 political support), and early in 2014 announced her intention to run again. Here, then, we have an aspiring councillor, a fully public figure, whose work must in the public interest be debated in as high-profile a forum as possible. If Facebook was the only tool available, then we would indeed all be forced to conduct our debates in Facebook. But anyone can set up a free-standing domain in the style www.something-or-other.ca (or www.something-or-other.com or www.something-or-other.org), and in Canada alone thousands of serious people and organizations do so. As I relate in detail later in this blog posting, I at first tried using as my www.something-or-other.ca the domain www.karencilevitz.ca, thereby exploiting Karen's own comic failure in renewing the registration of her own politically mission-central domain name. Subsequently (as I also relate in detail later in this blog posting), in the wake of an out-of-court legal settlement, I passed www.karencilevitz.ca back to Karen (with emotions that I am under the terms of the settlement forbidden to discuss), and adopted instead www.karen-vs-toomas-blog.ca. Let us, then, by all means move the debate to some appropriate free-standing domain. In so doing, let us give Karen herself, and all sides in all the debate (as I explain more fully later in this posting) every opportunity to write, without fear of censorship, subject only to the usual journalistic-ethics prohibitions on anonymity and discourtesy. I am appropriately qualified to create such a blog, because (a) I was a DDO employee from 2006 November to 2008 July, under two concurrent part-time contracts, and (b) I was in 2007 the founder, and since 2011 am a dissident member, in an organization presently chaired by Karen Cilevitz, the "DDO Defenders Inc."
Additionally, of the 4600-or-more hours which I have spent on the DDO heritage-conservation file since 2007 September 10, at least 96 hours, 56 minutes shows up in my formal computerized timelogs as time spent on the 2010 Cilevitz Town Council election campaign (for instance, in phone canvassing, in visiting a few hundred houses on about 18 individually logged days, and in attending meetings: in particular, I attended most or all of Karen's "Cafe Meetups"). A screenshot of my unhappy testimonial is available here. (The browser "Back" button should then be used to return to this present page). 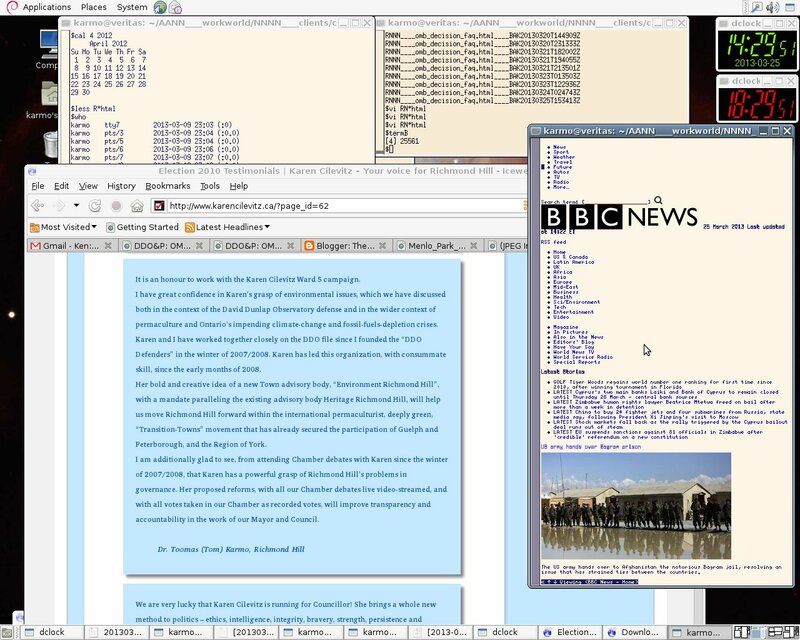 As can be seen from the Linux desktop clock, visible in the upper right hand corner, the screenshot was taken very long indeed after the election, namely, in the afternoon of 2013-03-25. Readers needing more context for my embarrassment can view comprehensive archives of www.karencilevitz.ca, from quite a few points in the days when that site was under Karen's management, by resorting to the "Wayback Machine" Web archive, http://web.archive.org/. Upon reaching that USA-based snapshots-of-the-bygone-Web facility, one gives its (self-explanatory) homepage interface the domain name www.karencilevitz.ca. An ensemble of www.karencilevitz.ca archive dossiers - one from 2010, two from 2011, one from 2012, and some more from 2013 onward - is thereupon retrieved. In general - i.e., even outside Karen's own distressing case - the Wayback Machine is a helpful tool for tracking changes politicians make to their public statements from one Web season to the next. A caveat is necessary here. While noting that I backed a very inappropriate political candidate in 2010, I do plead in extenuation that Karen did not align herself with the would-be DDO developer, Metrus-Corsica, until 2011. It was not until that point that she broke with other conservationist groupings in Richmond Hill, incorporated the DDO Defenders, and entered the trap which was Ontario Municipal Board mediation. My fault lay not in dishonesty but in a failure to predict what lay ahead. This is a matter which I discuss in detail in the blog posting timestamped 20140218T035440Z. Some readers will seek a more detailed account of my evolving relations with Karen. It is a little unclear how brutal I should be here. Is the public interest best served if I muffle awkward historical facts, in a rather anglo-Canadian feelgood style - or if, on the contrary, I trumpet them, as is perhaps more the norm in the feisty public life of (modern, post-Soviet) Estonia, or perhaps likewise of, say, (modern, post-Duplessis) Québec? On pondering this question, I have decided it best to trumpet, but not at maximum volume. I therefore am placing the relevant archive-with-commentary on a separate, appendix, page, viewable by clicking here. But do not click, o Gentle Reader, unless you for your part decide a degree of feistiness to be appropriate. Keeping an eye on several things Cilevitz in the summer of 2013, I noted to my surprise that Karen Cilevitz's team was not taking appropriate actions to renew its karencilevitz.ca. Surely, I thought, I cannot be so lucky as to capture that politically mission-critical domain from a careless Karen? Domain names in the .ca top-level domain are administered by the Canadian Internet Registration Authority (CIRA). If the owner of a domain name omits to renew the CIRA registration, the name is placed by CIRA onto a "To Be Released" (TBR) list. The Canadian public is then free to bid for the name. The name karencilevitz.ca was put onto CIRA's TBR list, and I put in a bid. I guess I had no competitor. For on 2013-09-05, I learned, to my surprise, that I was the new owner. Around 2013-09-05, I took the precaution of registering a few as-yet-unclaimed, and potentially attractive, domain names, linguistically close to karencilevitz.ca: karencilevitz.com, electkarencilevitz.ca, and votekarencilevitz.ca. I also for a few weeks in 2014 had possession of notkarencilevitz.ca. While I could hardly block Karen from setting up a replacement Web site, I thought I might as well prevent this task from becoming childishly easy. In the end, Karen's team must have groped around a bit and scratched their heads in vexation, finding this reasonable name and that reasonable name already owned by some mysterious, identity-cloaked, person or other. The team at last settled on the longish, and yet not hopelessly long, karencilevitzward5.ca. What can have gone so astonishingly, indeed comically, wrong within Team Cilevitz in August and September of 2013? Two competing hypotheses suggest themselves. (b) It could, on the other hand, be that Karen Cilevitz delegated the maintenance of her www.karencilevitz.ca to someone else on her team, who then damaged her by not being duly diligent at CIRA - perhaps proceeding with fully conscious subversive intent; perhaps (a second possibility) proceeding in wholly innocent inadvertence; perhaps (a third possibility) proceeding from that murky space of the subconscious in which one's overbearing superior is resented, and in which one proceeds to an act of sabotage-through-negligence half asleep - not in pure innocence, but also without elevating one's boss-sabotaging inaction to the level of fully conscious deliberation. As was perhaps predictable, Karen became vexed to find that I had my domain name in her control. I tried to tell her this when attending a public coffee-with-the-candidate café session on 2014-02-27, but she silenced me. I did manage to get the word through to her over the ensuing days, both in conversation and through the intermediary of the DDO Defenders secretary, our mutual friend Gloria Boxen. On 2014-03-20, Karen launched legal proceedings against me, against my hosting-registering company, and against the Canadian domain-names authority, in the civil action "Karen Cilevitz (Plaintiff) and Toomas Karmo, 2070424 Ontario Inc. and Canadian Internet Registration Authority (Defendants)", at the Ontario Superior Court of Justice, thereby generating Court File CV-14-118225-SR.
Karen and I settled this and another legal action (in which she sought a peace bond against me) in an out-of-court settlement, with all her actions withdrawn, on 2014-05-05. As part of our settlement, I transferred all my domain names containing the string cilevitz, very notably including www.karencilevitz.ca, to Karen. Karen was in this work represented by Cherniak Law, and I by Blake, Cassels & Graydon LLP (Blakes). Particulars of these firms may be viewed at, respectively, http://cherniaklaw.com/ and http://www.blakes.com/English/Pages/default.aspx. Some information on recent Blakes cases, with a link to further material on their much-cited Supreme Court libel-law case Grant v. Torstar (Blakes represented Torstar, who in prevailing caused the "Fair Comment" defence to be widened in Canada) can be had from http://en.wikipedia.org/wiki/Blake,_Cassels_%26_Graydon. It was agreed in the out-of-court settlement process that I might transfer my blog content, with some changes, to www.karen-vs-toomas-blog.ca, and that I might publish the pertinent legal documents online. This latter publication I have chosen to make at a dedicated domain, www.karen-vs-toomas-legaldocs.ca. Further details of the legal settlement are not appropriately given here. I am barred from commenting on the terms of the settlement beyond what I have written in the Minutes of Settlement, "Schedule C" (and have, to reiterate, duly published at www.karen-vs-toomas-legaldocs.ca). Karen is barred from commenting on the terms of the settlement beyond what she has written in the Minutes of Settlement, "Schedule D" (and which I likewise have duly published at www.karen-vs-toomas-legaldocs.ca). The author must identify himself or herself in communicating with me, making both first name and surname clear. This must normally be done by sending me a correctly self-identifying e-mail, in the body of which appears a telephone number that I can if necessary call to prevent my getting duped by some forged identity. In the special case of Karen, our 2014-05-05 out-of-court legal settlement forbids our communicating personally. It is therefore necessary that Karen's blog postings, should she choose to make them (and she must, if a skeptical public is not to label her debate-shy) reach me by some trusted indirect channel - for instance, through her lawyer, in communication with my lawyer. The author satisfies the normal legal tests for probity in publication: free-expression rights under Section Two of the Canadian Charter of Rights and Freedoms are duly exercised, without descent into hate speech or other species of criminal offence or civil tort. Having just cited John Michael Greer's "Archdruid Report" blog, I might add that my conditions are the same as the conditions which have for decades governed the letters-to-editor printed in Ontario's mainstream newspapers.